Argo Navis, literally the Ship Argo, represents the vessel that transported Jason and the Argonauts to and from Colchis, as the quest for the Golden Fleece was undertaken. 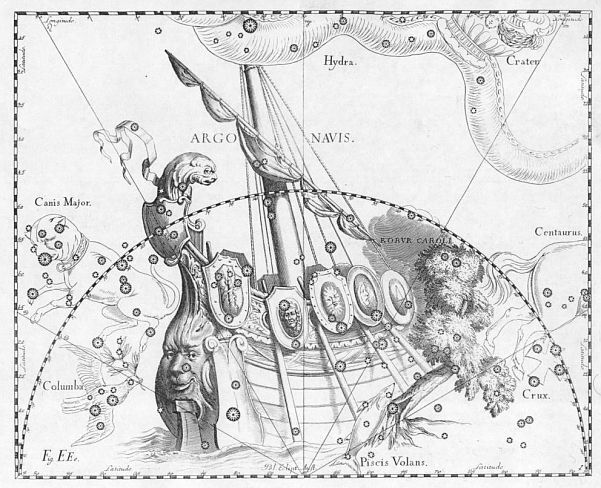 The Argo was constructed by Argos, from a design of Athena, and was partially made with magical wood from Dodona. The Argo would successful navigate to and from Colchis, encountering, and surviving, many dangers on the voyage. 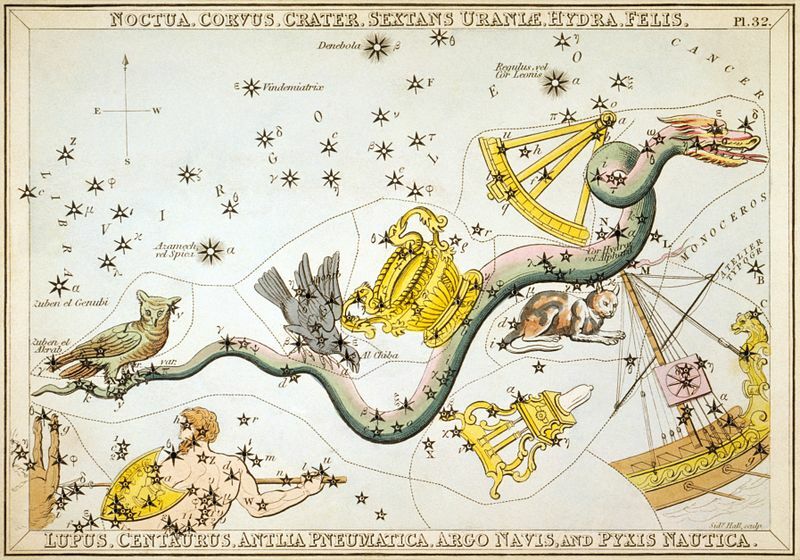 After successfully returning to Iolcus, the Argo was consecrated to Poseidon, and its likeness placed amongst the stars, although the hulk of the ship rotted away. 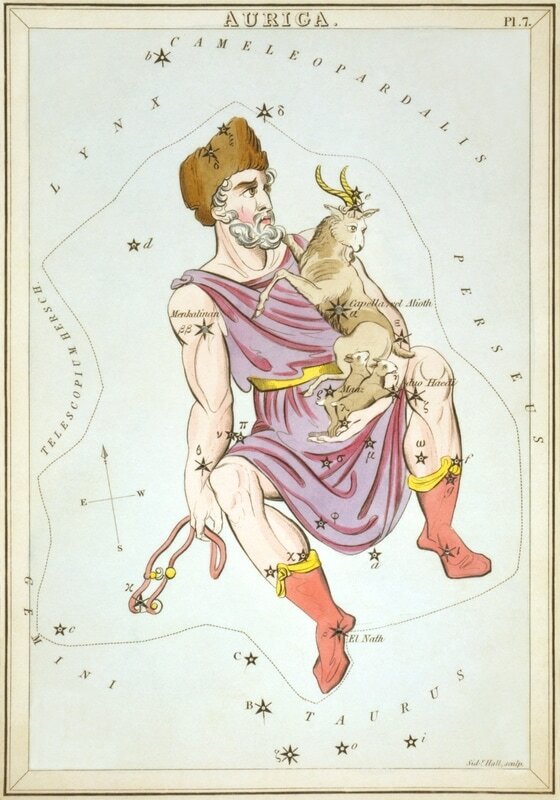 Aries, the Ram, is one of the most famous constellations from antiquity, being as it is, also a sign of the zodiac. 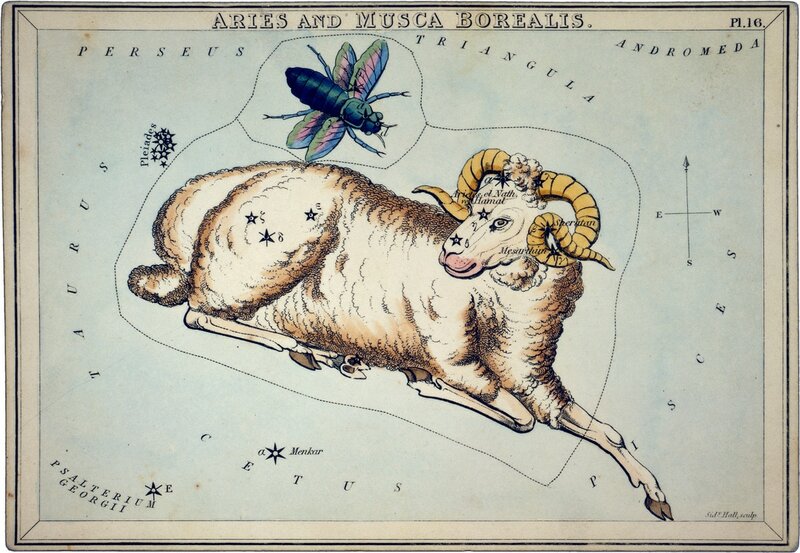 Aries is generally considered to be the representation of Crius Chrysomallus, the Golden Ram that rescued Phrixos and Helle from harm at the hands of Ino, and started to fly them to Colchis. Only Phrixos would make it safely to Colchis, and the golden ram told the young boy to sacrifice his rescuer, a sacrifice that gave up the Golden Fleece of mythological fame. 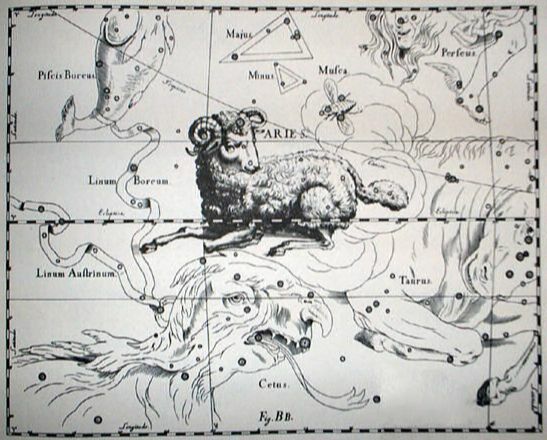 Occasionally it is said that Aries was actually the Ram of Ammon, who appeared and guided Dionysus to a source of water when the god was leading his army, which was dying of thirst. 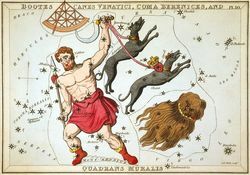 Auriga is the Charioteer constellation, and in Greek mythology various stories are told of who the charioteer is meant to represent. 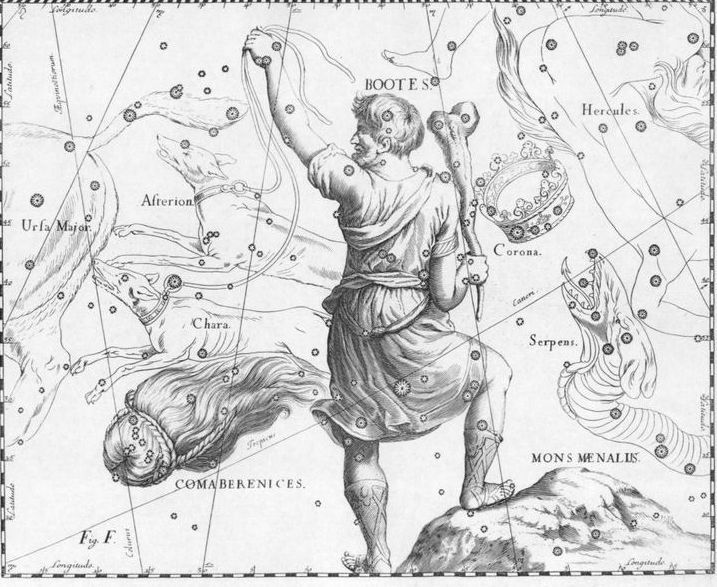 One possibility is Erichthonius of Athens, a king born of the earth when Athena rejected the advances of Hephaestus. King Erichthonius was credited with inventing the quadriga, the four horse chariot. 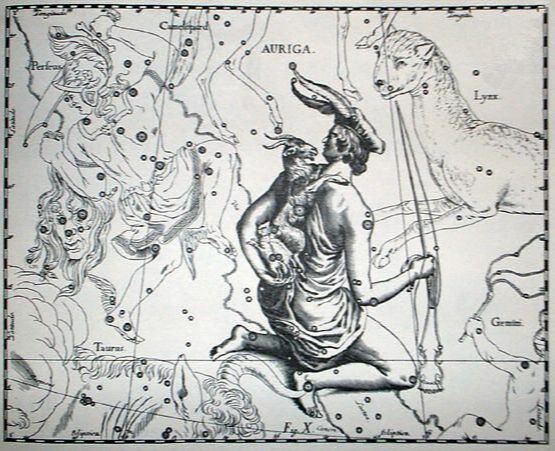 Alternatively, Auriga could be said to represent Myrtilus the charioteer of King Oenomaus, who died at the hands of Pelops, after the son of Tantalus had won the hand of Hippodamia; Or else it was Hippolytus, the son of Theseus, who was killed in a chariot accident; or it is Orsilochus a man from Argos who was said to have invented the chariot. Bootes is a name normally translated as Ploughman, and the ploughman in question is normally considered to be Philomenus, a son of the goddess Demeter, who was the benefactor of man for he invented the plough. Alternatively, Bootes might be the representation of Icarius, a man blessed by the god Dionysus. Icarius would thereafter make the most intoxicating of all wine. When some people partook of the wine, others believed that they had been killed, and so Icarius himself was killed, with his daughter, Erigone, and dog Maera, subsequently committing suicide. Dionysus would place Icarius amongst the stars, with Erigone becoming Virgo and Maera becoming Canis Major (or Minor).